Snowdrops are early spring flowering bulbs, even sometimes emerging through the snow in the late winter, providing a very welcome source of food for bees and other pollinators. Popular as an ornamental plant, snowdrops are often cultivated in gardens and parks but are also a great choice for light or deep woodland ground cover. Although requiring full sun/partial shade, the bulbs do well in the moist soils of deep woodland as by the time the upper canopy is in leaf, the bulb has less light needs. The plant has insecticidal properties and can be used against pests in the orders Coleoptera (beetles), Lepidoptera (butterflies and moths) and Hemiptera (true bugs including aphids and leafhoppers). To order this plant please contact us balkanecologyproject@gmail.com. Snowdrops and their bulbs are poisonous to humans and can cause nausea, diarrhoea and vomiting if eaten in large quantities. Bulb growing to 0.2m x 0.1m. It is hardy to zone 4 and is not frost tender. It is in flower from Feb - March, and the seeds ripen May - June. The flowers are hermaphrodite (have both male and female organs) and are pollinated by bees and flies. It is considered highly ornamental. It can grow in semi-shade (light woodland) or full sun. It prefers dry moist soil. 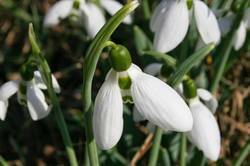 All snowdrops (Galanthus spp.) are included in CITES Appendix II. Our bulbs are harvested from our own gardens. Flowers: Single erect flower bud, which later becomes pendent. Beautiful delicately slender bloom often with a honey like fragrance. It is a very ornamental plant. Mineral Dam - prevents leaching of minerals. Avoid planting single bulbs, Small groups are best, slowly spreading over time to form large colonies. Note that overly congested clumps will eventually fail to flower.